Falconers all over the world have hooded birds for centuries. The use of the hood in falconry birds has been documented in most historic falconry resources; but why? Can you answer that? Most falconers have been exposed to hooding in varying degrees, but I suspect that most wouldn’t be able to come to an agreement on why. They may even be able to agree on some of the behavioral benefits, even while still not understanding the mechanics of how and why a hood works. I may not have decades of falconry experience, but I do believe in the value of hooding. I have spent a lot of time the last few years reading falconry texts, talking to successful falconers, observing them, and applying that knowledge to my own birds to include broad wings, short wings and long wings. A very common trend that I have seen in successful game hawkers is the extensive use of the hood. This is not to say those that don’t hood, or even not consistently, can’t be or aren’t successful, but that there appears to be a definite parallel between consistent hood use and field success. Hooding is both a learned skill and an art form. It can be as difficult or as easy as you make it out to be. It is my opinion that the reason hooding appears to be on a path of becoming less common compared to the use of giant hoods (which can be a successful alternative in certain situations) or not hooding at all is that often during the apprenticeship process, fewer and fewer apprentices are ever taught the values or the mechanics behind hooding. We’ve all heard many reasons describing how a hood works, from “it’s like a parrot cage cover, it just calms them down” to “it forces them to use all of their other senses that they normally don’t rely on”. These reasons explain some of what happens, but it still doesn’t disclose the psychological mechanics. Let’s break down why a hood is an effective tool for manning and field hawking a falconry bird. The primary key to the value of hooding, based on my observations, is the ability to control the experiences that a bird is exposed to. The birds, regardless of whether they are chamber, hacked, passage, wild or captive bred, relate their relationship to the falconer based on their visual interactions directly and indirectly. The proper use of the hood allows you to control those interactions. Simplified, I believe the bird “grades” interactions into three basic and logical categories. Negative, neutral and positive. When un-hooded and not being fed or hunted, especially early on in the relationship, the bird can only see any interaction as negative or neutral at best. They have little interest in you at this stage in the game, so everything you are doing is under heavy scrutiny. It’s very easy to slip up and create a negative interaction, even if it’s not with you, but with something they associate with you like dogs, cars, certain gear, etc. Even if you are doing everything right, and the bird is calm, you can only have a neutral effect at best, and more commonly, a negative experience if the hawk is un-hooded without the re-enforcers described above. Most un-hooded manning without food present is not a positive interaction, but neutral in the sense that the bird is being conditioned that you are not dangerous or a risk, but there is nothing the bird sees as positive or better than the baseline condition of simply existing. Without positive re-enforcement, you are simply hoping to habituate the hawk to your presence . The hood allows you to control those interactions the bird has with you and his or her environment. Early in the training cycle, the hood would come off, and the first thing the bird sees is food, making the interaction with you positive. The hood goes on and now whatever is being done in the area can’t be construed as negative. Accidentally put food in sight of the bird while hooded, no effect, wave an arm too fast, didn’t see it, and you get the idea from here. An un-hooded bird can and may find the sight of food in your hand as “theft”. A bird at weight is looking for that next food or hunt, and it’s a lot easier to make a mistake in the relationship when the bird is itching for that next meal and already sees you as a partner. The appropriate use of the hood allows you to mitigate those potential issues. It is not uncommon for falconers to keep a young and fresh bird in the hood for the majority of its time except during actual training. 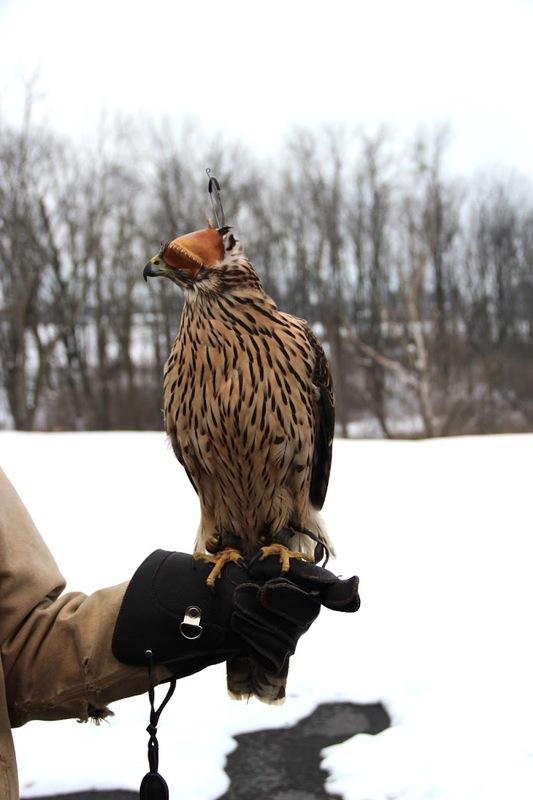 Once the bird is accustomed to the falconer and routine, un-hooded weathering would be introduced after the bird has already had nothing but positive and neutral experiences with the falconer. I condition my birds that the only thing that’s going to happen when the hood comes off is food or flying. Both of which are positive events in the bird’s existence. A little bit of high-level tid-biting to get the message, and then a set schedule will reinforce the meaning of the hoods removal. I often weather my bird in the evening and then hood the bird before I turn in. The next time that hood comes off is to fly or be fed a hold over meal until the next flight. I will always provide the lesson, flight, or food immediately after the hood is removed, although some birds have a little “wake up period”, to keep the mental state that the hood removal is the sign for something to come. Even later in the game the repetition of hooding can create a mental connection between what is to come when the braces are struck. It can act as a trigger mechanism for the hunt to start. You’ll often see the hood used to “reset” a bird after a quarry is caught before continuing a hunt. This conditioning happens by the repetition of using the hood at the same time in the hunting/flying schedule and cycle. In conclusion it has been my observation that the answer to what is the value of hooding is found to be the control of the meaning of the events tied to the hood, and removal of events happening outside of the hood. By taking advantage of the control given to a bird’s life experiences, hooding gives the falconer an excellent stepping-stone to success. Take the application of the hood and use it to your advantage as a behavioral shaping tool, and you may find more success. The hood is not simply a “shut down the bird” piece of your falconry equipment, but an item that when properly used results in a psychological conditioning method that can be tapped to assist you in developing a behaviorally solid, and field ready hunting partner. This page was written by myself, Gregory Miller, and may not be the opinion of all falconers.